The countdown has begun for the world-famous Piccadilly Lights to be switched back on, after over nine months in darkness for major renovation work. 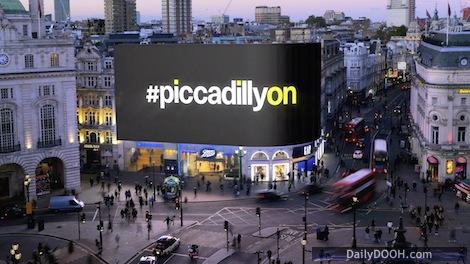 To mark the moment, Landsec, the UK’s largest listed commercial property company  and owner of Piccadilly Lights, is launching the #PiccadillyOn campaign, bringing colour to life in aid of Barnardo’s. At the moment of relaunch, the screens will be powered up with a spectacular display of the sponsored colours, each of which will be shown on screen and live streamed on Facebook  for fans across the globe to watch. By visiting www.PiccadillyOn.London  you can choose your colour to support Barnardo’s and be part of this historic moment. You’ll receive a unique digital colour chip to post on their social media channels. All money raised will go to Barnardo’s, the UK’s largest children’s charity and Landsec’s national charity partner for 2017. Coca-Cola, which has long been part of Piccadilly Lights’ history, has kicked off the fundraising with a donation to sponsor their red colour chip.